Have you been out to Morse Creek lately? If you look to the south as you cross the old (and lovingly restored) railroad bridge, there's a lizard painted with yellow on the creek bottom. Click on the image to the left for a closer view. We are not sure of who the artist is, but last year someone painted a rainbow path on the north side of the bridge, and as the winter progressed and the river flowed, the rainbow was broken and its colored stones scattered. 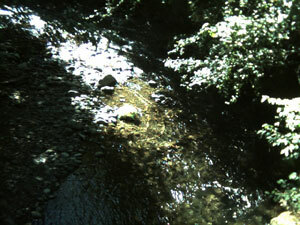 For now, the lizard is intact, and the river flow is weak. We'll see how things go this winter, and look forward to next season's river bottom painting. We often see starfish at Second Beach, particularly at low tide, but on our last visit we saw several stranded sea stars. You can tell they are echinoderms, related to the starfish and sea urchins, because they have five fold body symmetry. 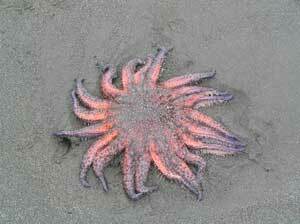 In fact, they look a lot like starfish, except they have 20 legs, rather than just five. We've updated our tide tables for La Push, which is right near, and has almost the same tide schedule as, Second Beach. You can even download an iCal calendar to set up a trip at low tide so you can explore the tide pools and caves more easily. This has been a very dry summer, even in the high country, there is not as much water as usual We were up at the Potholes above Deer Lake, and the drought was really visible. 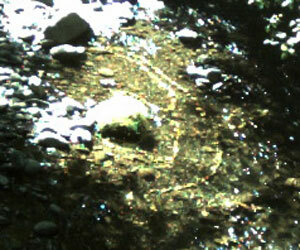 There is usually water in the pothole shown on the left. That grass has been growing for a fair while. 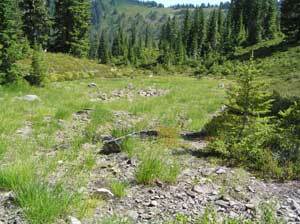 Let's hope that the autumn rains come soon, and we have a good snow pack this winter. We need it.